intuVision Core provides our seven core events at a lower price-point. Core is included with each of our domain specific modules, but also is available for separate purchase. intuVision Core includes our base event types, using our world-class, robust analytics. These basic analytic events are an ideal match for many projects, as they are paired with our unlimited classification types, robust configuration options, and can be used as either count/aggregate events or alarm events. For many scenes involving simple intrusion detection or object counting, these base event types will prove sufficient. Tied to our award winning object detection, these events will give you the alarms or counts you need, without additional costs for our other, application specific, event types. These events can be used as count/aggregate events or as alarm events, ensuring the event information method matches your needs. Object classification ensures that you receive only the events that are of interest to you. The core events can be tied to our default person and vehicle classification types and - since we provide unlimited additional classification types - can also be used with any other object type of interest, including animals, motorcycles, trucks, etc. While the Core Module limits the type of events that can be used in the system, we still provide access to all of the capabilities provided in intuVision VA, including: full access to optimization algorithms and settings, VMS integration, input and output triggers, weekly scheduling with override dates, user management, user group customization and control, floor plan and video based review, event archiving and review, event graphing, heatmap generation and sharing, object track search, and more. Specialized events for our four primary application types, face, retail, security, and traffic, are available in each application module. Each module includes the core events. intuVision Core events are included in the intuVision Modules, intuVision Face, intuVision Retail, intuVision Security, and intuVision Traffic. Activity Detect activity in a zone. This can be used for a wide variety of situations, from security to manufacturing and more. Color Search Perform an color based search of people or vehicles, to quickly find suspicious objects after an event has occurred. 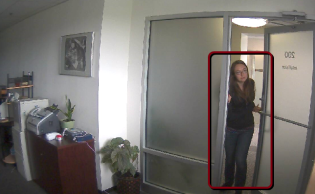 Camera Tampering Detect when a camera has been obscured or blocked, either intentionally or maliciously. Direction Detect vehicles or people moving in the wrong direction, either approaching a secure location or moving the wrong way down a one-way. Idle Object Detect people, vehicles, or other objects loitering or idling in your view. Alarm after they have been stopped for a specified duration. Smoke Detector Visually detect if a fire has occurred in your camera views. Smoke and fire detectors do not work well outdoors, our visual detector will notify you right away. Throughput Detect objects crossing over both active edges of the zone. Higher confidence method to reliably count vehicles and people, detect intruders, and more. Zone Intrusion Detect if someone or something has entered into a zone. This is helpful when you have information about how intruders will approach a facility, or to protect construction areas, etc. 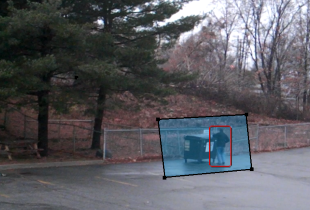 Far View Perimeter Intrusion - use intuVision VA to cover large areas with just one camera. Detect people only a few pixels high, and process HD videos easily with GPU acceleration. This table offers a comparison between the three major versions of intuVision VA - intuVision LiTE, intuVision Modules, and intuVision Core. For more information on the domain specific event rules included in each module, see the specific module page: intuVision Face, intuVision Retail, intuVision Security, and intuVision Traffic.